Getting Your Read On: The Rules in Rome by A.L. Sowards + $25 and Book Giveaway! 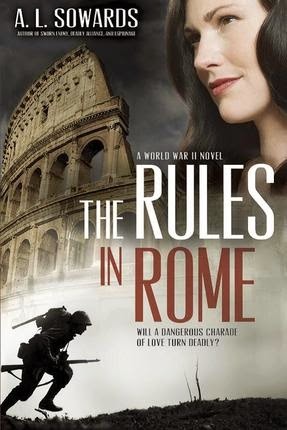 The Rules in Rome by A.L. Sowards + $25 and Book Giveaway! With Hitler's forces firmly entrenched in Europe, countless heroes seek to end the madman's reign. Bastien Ley is one of the best. Working in Italy for the Office of Strategic Services, he's been tasked with sabotaging German convoys. When his team kills an officer headed for Rome, the man's similarity to Bastien is undeniable, and seeing an opportunity to turn the tide of the war, Bastien makes a bold decision: he will assume the dead officer's identity. He become Dietrich, an Iron Cross-wearing German officer—an ideal position from which to infiltrate the Nazi ranks in Rome. Bastien's assignment becomes extremely stressful, and his superiors send him a reinforcement in the form of the lovely Gracie Begni, an intelligent, eager, and completely inexperienced radio operator. With a gulf of resentment between them, these two agents must find a way to portray a couple in love. Soon their reluctant alliance becomes much more as Bastien and Gracie find themselves getting lost in their feeling for each other. But as they engage in battle against the deadliest foe the world has ever known, the pair quickly realizes their love may be doomed. As the Rome Gestapo threatens to destroy all they've worked for, will Bastien and Gracie survive their charade? Historical fiction is one of my favorite genres, especially when it is done right. I love getting a bit of a history lesson without it actually feeling like a history lesson. This book is set during WWII in Rome, Italy. I have read a lot of books set during WWII but I cannot remember any in Rome, Italy. It was interesting and heartbreaking. War is awful. Because I know some of the travesties WWII brought, I was on the edge of my seat the whole way through this book, just waiting for those awful things to happen. There was so much anticipation on my part. Gracie is a character I really enjoyed. She is brave but she is also frightened sometimes. She has courage as well as a tender heart. Bastien will grow on you. He comes off cold and distant but that is his training and his desire to keep safe and successful in his mission. I enjoyed getting to know him gradually with Gracie. This book has references to the "Mormon" religion, but there isn't anything preachy or overbearing in it. There is no swearing or sexual situations. There is some violence.